EncapuGuard GREEN Post Cleaning Protective Treatment employs the use of soil resistance, stain protection, wicking prevention, and residue neutralizing technology. EncapuGuard GREEN brings the benefits of encapsulation cleaning to hot water extraction cleaning jobs. EncapuGuard GREEN is formulated in conjunction with guidelines established by the U.S. EPA Design for Environment Program. EncapuGuard GREEN replenishes the soil resistance and stain protection that came with your new carpet. It enhances "cleanability" and spot and stain removal with exclusive encapsulating polymer protection you won’t find in conventional carpet protectors. 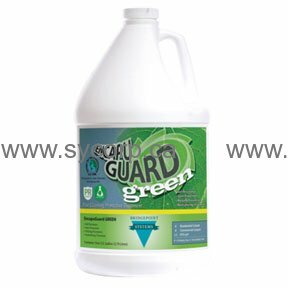 EncapuGuard GREEN will provide your customer with easier spot and spill clean-up. The carpet will last longer, as the protection reduces carpet wear from abrasive soling, especially in high traffic areas. Subsequent vacuuming will be easier, faster, and more efficient. The encapsulating polymer additive will also virtually eliminate wicking of soil or spills after hot water extraction cleaning that often occurs on many carpets. It pH neutralizes any alkaline cleaning residues and protects against browning and yellowing. EncapuGuard GREEN will leave the carpet cleaner and fresher and is safer for children and pets when used and applied as directed. Replenishes soil resistant treatments that came with carpet and enhances "cleanability"